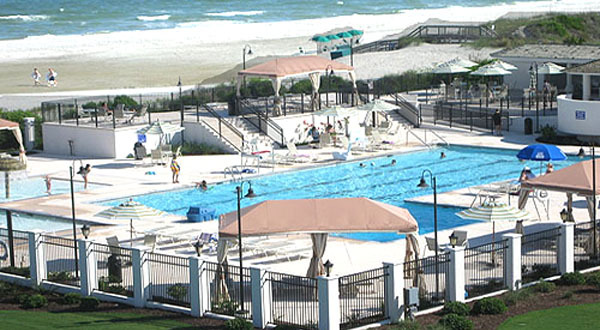 The Dunes Golf and Tennis Club is the one exclusive country club in Myrtle Beach that means "you have arrived". The Dunes Golf Course is the oldest course in Myrtle Beach, built in 1948, and the clubhouse has been through many incarnations to become the oceanfront oasis for the rich that it is today. Tennis was added to the club in the 70's and there are now 8 courts. It is said to have one of the best tennis programs around, with USTA-sanctioned tournaments and leagues. The clubhouse offers a 700-foot oceanfront pool with snack bar, showers, and lockers as well as swimming lessons and camps. Indeed, the whole area is so gated and secure that it's nearly impossible to find photos of the amenities. The neighborhoods are lined with hundred-year-old moss-draped oaks and reflect the "plantation theme" of the times in which they were built. Impressive and truly magnificent, the mansions in The Dunes Club are one of a kind. The homes that are near Highway 17 are protected by a decorative but effective brick wall that prevents prying eyes and protects the residents living around the golf course and country club. A newer section of the Dunes Club family is Dunes Cove, a bit further north and still offering undeveloped lots and homesites. Most homes in the Dunes Club community start at about a half million and many of the luxury mansions are multi-million dollar marvels. You'll find a few that are more affordably priced below $500,000. 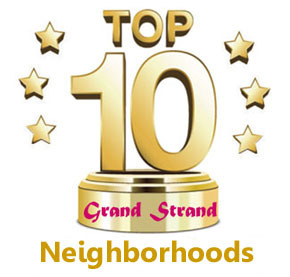 This is truly the neighborhood for the very wealthy and those who value prestige and privacy. Most homes will have to be shown by appointment only, so call us well in advance if you find one that you fall in love with.